SCRAPiVERSE: October Afternoon's 9 to 5 Collection! Product Photos from OCTOBER AFTERNOON's blog. OCTOBER AFTERNOON's newest collection has sent my prescription cough syrup addled brain into a tailspin. It's just past amazing and almost over to live-changing. Kind of like the time I had my first vodka & tonic in a Dallas hotel room. You know, that moment something or someone enters your life and you know you were meant to be together? 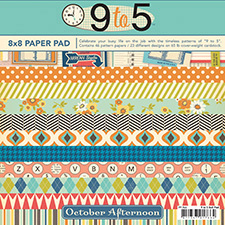 OA's '9 to 5' is a vintage inspired office daydream- vintage colors, patterns, even a dark-wood paneled 'boardroom,' all brought to life in a sexxxy secretary 12X12 patterned paper way. Scrap up a mini-book about your job, MadMan style! Relive your Xerox dreams! All your dreams are possible, now! When I was a little Kory, my favorite 'game' was PLAYING OFFICE. I had a cubicle area setup in a corner of my bedroom, where I kept my bright blue manual typewriter, my wire IN/OUT boxes, stacks of paper and random office supplies- and a copy of a dog-eared Office Depot catalog that I would circle objects I thought I needed to 'order.' Clearly, October Afternoon built this collection for ME. See the entire collection, HERE, at October Afternoon's blog. Check out the set of STAMPS- with a terrific rotary phone graphic, the journal cards, and their set of coordinating SPRINKERS ink sprays- great colors, an incredible collection. I love everything by OA, and this is no exception. MOE!!! Need I say more? Glad you're on the mend! I have been eyeing this one too Kory, its amazing! Thanks for sharing and I hope you are feeling better! Ohhh Ahhhhh..love it!! I am sorry to hear you have been sick. Hope you are back to the normal Kory K. again! lol I'd like to ask you a question..if it's not too much trouble can you please email me at heathernovinger@hotmail.com? Thank you!